Mounds of brightly-colored spices caught Cameron Powers' eye as he walked through the marketplace in Aqaba, Jordan. As did the goat carcasses hanging upside down in rows. And the donkey carts scattered amidst the run-down vegetable stands. "You see all kinds of strange things," says Powers, a 58-year-old musician and world wanderer. But perhaps the strangest thing of all was Powers himself, and his traveling companion, Kristina Sophia, who sang for strangers as they waded through the marketplace: two white people from Boulder promoting peace through their music at a time when their country is openly considering war. "We wanted to bring American hospitality to the Middle East," Powers says. "We're trying to be a bridge between America and the Arab world right now." For almost five weeks in November and December Powers and Sophia journeyed through the cities and deserts of Jordan. They played music in crowded squares and city parks. They stayed with locals and spoke with Iraqi refugees who had fled their country for fear of a U.S. attack. He and Sophia chose Jordan because of its proximity to Iraq and the West Bank. 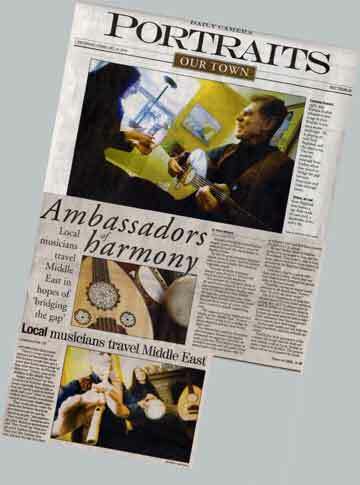 They hope to play in Iraq soon, where they have been invited to perform by the Baghdad Musician's Association. Until then, they're content with their stay in Jordan, where they say they experienced firsthand the generosity of the local people. "I feel like issuing an urgent travel advisory to all Americans," Powers says. "Go visit the Arab world." The U.S. Department of State has already issued its own travel advisory, stating that "all U.S. citizens who remain in Jordan or choose to travel to Jordan are urged to consider seriously their personal security and to take those measures they deem appropriate to ensure their well-being." Powers and Sophia say the risks are being overblown, and the rewards are many. They'll give their perception of the country, its people and the Arab culture during a talk at 2 p.m. Sunday at Unity Church in Boulder. The presentation will be accompanied by music and slides from their travels. "There's a huge thirst in America for knowledge about this because people have got a sense that there's more going on than what they see on Fox evening news," Powers says of the situation in the Middle East. Sophia and Powers say they learned a lot from the displaced Iraqis, especially that people in Iraq are "pretty much in survival mode right now." Even so, most of them don't harbor resentment toward Americans, Sophia says. "They would always make the distinction between American government policies and the American people," she explains. "They would say, 'American people good, American government bad.' They would say 'Iraqi people good, Saddam Hussein bad.' They don't like Saddam Hussein, but they feel like he's their problem so they should be the ones to take care of it." It was even more apparent that the Jordanians felt no ill will toward the traveling duo. In the marketplace in Aqaba, kids ran up to Powers as he strolled through the streets, noticing the stringed oud slung across his back. They begged him to play, clearing a space on an old bleacher for him to sit. "These kids were going wild around us," says Sophia, a 49-year-old singer and early childhood educator, "just clapping and singing." Soon the shop owners gathered around as well. "They're not the least bit inhibited about joining in with the music," Powers says. "And they have no inhibitions about singing and dancing in public." When Powers finished playing, he and Sophia stuck around and had tea with the locals. "The hospitality is absolutely incredible," Powers says. As opposed to America, Powers muses, where he and Sophia met. It was roughly three years ago, at a benefit party in Boulder, when Sophia invited him to sing with her on stage. "There was a very strong connection from the start," she remembers. "We sang before we even talked." Music has always been an icebreaker for Powers, who has been playing various instruments for the past 30 years. His latest fascination is with the oud, a stringed noisemaker of the Middle East and north Africa, much like a lute. It came in handy in Jordan. "It's just like this little key you open up their hearts with," Sophia says. "They immediately love you." The duo sang with their cab drivers. They sang with Bedouins in the desert. Gail Hollander of Boulder, a friend of the two, loved hearing about that as she followed their travels from Boulder via email. "To actually connect with people on a heart-to-heart basis through music and language is the kind of grassroots thing that could actually result in bridging cultural differences," she says. Locals often responded to their Arab songs by inviting them into their homes, Powers says, and never did they feel threatened in any way. "I think it's safer there actually than it is here," Sophia says. Safer, more welcoming and less materialistic; something Americans could learn from, Powers says. "If we don't bring our prejudices or our predisposed ideas then we just have this gift available where we can see a window into a whole other way of being," Powers says. "Having the ability to see into another culture's heart and soul is becoming a lost art." "We're raised by Walt Disney movies first, then by the evening news to think of all Arabs as sneaky sultans or modern day terrorists. And we completely miss the point that 99.9 percent of the people over there just want to be left alone and live their lives." For more information, go to cameronpowers.com or musicalmissions.com. 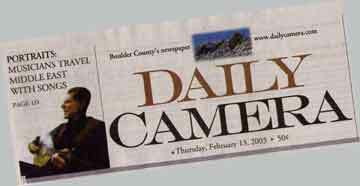 Copyright 2003, The Daily Camera. All Rights Reserved.